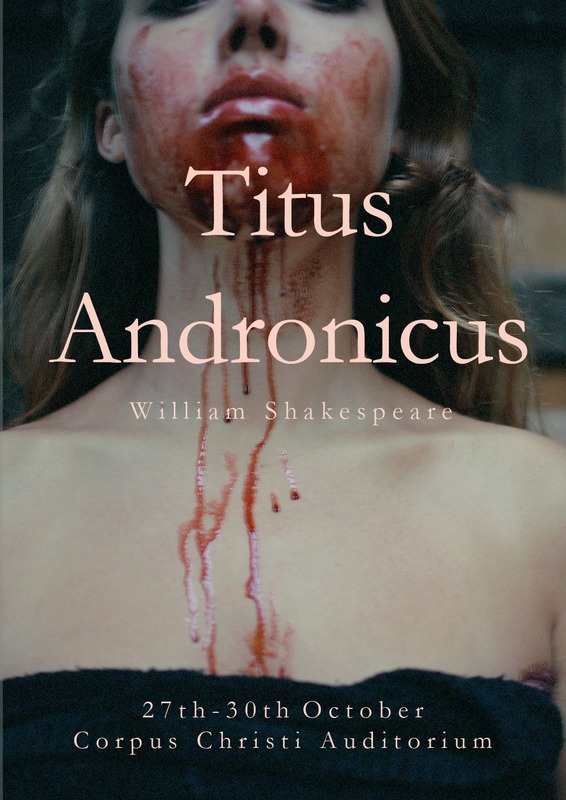 Shakespeare’s Titus Andronicus can be hard to render on stage without slipping into pantomime. Thankfully, the production currently running at Corpus Christi College manages to avoid this pitfall, creating a dark, gory, and gruesome atmosphere in an utterly compelling way. Minimal stage and costume designs are effectively contrasted with sinister splashes of red: blood on black and white clothes, red fabric in Tamora’s Empress costume, and red lighting that bathes the entirety of the stage at the play’s climax. The relentless deluge of violence and murder was helplessly captivating, despite — or perhaps partly because of— the disturbing content of some scenes. Despite a shaky start (probably due partly to the plainly dialogic character of the first scenes, and partly to the time it took for the cast to warm up), this is a powerful production of Titus. Mia Smith’s portrayal of Lavinia is certainly the most mesmerizing performance of the first half, succeeding in expressing the innocence and purity of this character. After she has been raped and mutilated — her hands and tongue are cut off so that she cannot tell what has been done to her — by Tamora’s sons, Demetrius and Chiron, her expressivity becomes even more transfixing: humming, sobbing, and crying are the only sounds she is now able to produce, and Smith’s performance is moving and full of pathos. Titus and Aaron — played by Joseph Stephenson and Gerard Krasnopolski — are similarly enthralling, especially in the second part of the play. Titus’s contradictory lucid madness was successfully conveyed by Stephenson, particularly in his vengeful acts against Tamora and her sons. The combination of a Tarantino-like violence (the play never slipped into parody, but it definitely did not try to tone down the goriness) and Titus’s madness created a black humour to which the audience seemed to respond very actively, with Alex Hill’s Marcus providing a foil for Titus’s madness. Krasnopolski’s powerful portrayal of the devilish Aaron would be fit for a Mephistopheles in Dr Faustus, articulating the contradiction between his utter evilness and his love for the illegitimate child he has with Tamora (Jessica Elizabeth). The performance of the latter started promisingly, but did not succeed in conveying Tamora’s darkest and most evil traits, with the exception of the compelling love scene with Aaron. The stark simplicity of the set and costumes were reflected in the staging. The space — Corpus Christi’s Auditorium — was left quite bare, but the stone architecture serving as the backdrop provided ample decoration. In combination with the relatively small size of the venue it gave the effect of a medieval prison, particularly as the stage cover was slowly bleached crimson. Shakespeare’s text is slightly altered — without giving spoilers, the play ends on an unexpected note. The curtain falls on a final, murderous scene bathed in red light, the epitome of utter despair and hopelessness. The cast did not come out to bow for the final applause which, through leaving something of a void, amplified the desolation of the final scene. The actors themselves seemed transformed by the experience of acting, emphasising the human impact of the tragic tale. This production is powerful and disturbingly enticing, much like a horror movie that — despite its goriness — we cannot help but watch.